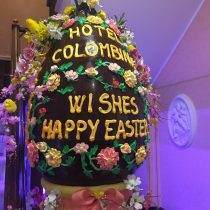 Celebrate the Easter festivities with us at the Colombina Hotel. During this special time of the year, the hotel dresses up for the occasion and a giant chocolate colorful Easter Egg will be displayed till Easter Monday and then, on Tuesday afternoon, will be broken and enjoyed by the hotel guests. Do not miss this opportunity to stay with us and join the event !